The lady black angels have pulled off a stunning sixth victory in a row in yet another must-win final to again end a highly fancied opponents season. The Blackburn lady vikings had no answers, no answers at all for the girls from uni who unleashed blitzrieg throughout the entire evening here at the state basketball center against a stunned opposition. In what could possibly be the final go-round for club legends Kylie Turnley, Rhia Mikkor and Melanie Fidler, the girls rallied around each other to avenge last years heart-breaking preliminary final loss to Blackburn. With strong support from a big crowd of uni faithful, the girls came straight out of the blocks ready to play and boy oh boy, did they mean business. Blackburn was shut down by a stifling defence predicated by fast feet, player switching, hard boxing out and frenetic rebounding. At it's essence, the girls put together a masterpiece, holding the always dangerous vikings to their lowest score of the season and restricting them to a miserly 48 points. For Blackburn, the class of their youth was on display but 17yo sensation Andrea Belmonte was well held and their leading scorer Tara Bohanna was also kept in check prior to fouling out. Tayla Deane put in a very solid performance and was leading from the front for blackburn as they trailed by just 4 at half-time. MVP for uni was canadian sensation Katelyn Leddy who tore down 9 clutch rebounds to go along with a game high 19 points shooting a smooth 13 of 16 from the line. On the offensive end, she received plenty of assistance from Melanie Fidler and Claire Landby with 12 apiece, Clare's haul coming in at a very comfortable 57%. The defensive efforts of Amanda, Phina, Rhia & Cat were getting stops everywhere you looked but it was Olivia Krygger's massive block late in the game that really got the crowd to their feet as it became clear that maybe, just maybe, this team will go all the way. Coaching staff Sam, Santo & Sal were rightfully stoked after the game. After a bit of an up and down year, everything has started to gel and come together right at the business end of the season. 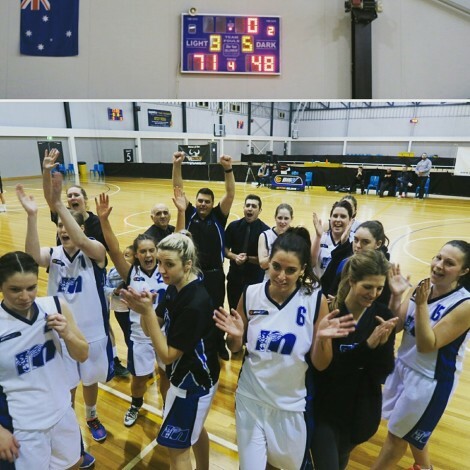 The girls are now through to the 2016 Division 2 Big V grand final next weekend against the Casey Caveliers. Assuming it's a three game series, that means we should get to host our final game of the year at Tin Alley on Saturday night so make sure you block it out and stay tuned. © Melbourne University Basketball Club 2019. This page was last updated by smoke on August 22nd, 2016.